Ivy Bridge brings MOAR POWER! 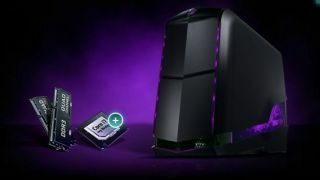 While Dell showed off its new Alienware laptops a few months back, it has now announced that its flagship Alienware gaming desktop Aurora has been given an upgrade with new processors, new graphics and a new optional ALX chassis. Alienware Aurora is now equipped with Intel's Ivy Bridge-E 4000 series Core i7 processor, which comes with either four or six cores and overclocking speeds up to 4.3 GHz. You can also choose Nvidia's latest GeForce 700-series graphics or AMD 8900-series GPU. The desktop also comes with quad-channel DDR3 memory support and four internal drive bays for upgrades. Along with the internal refresh, you can also upgrade its shell to a new ALX chassis, which Dell says now has an "intelligent thermal management system" for better heat dissipation. The Alienware Aurora entry configuration comes with a 2TB Raid 0 hard drive, 8GB memory, Intel Core i7-4820K Ivy Bridge-E processor and an NVIDIA GeForce GTX760 1.5GB DDR5 graphics card. The starting price for this configurations is $1399 (£1,099 and AU$2,699). Is Alienware planning tablets and smartphones?